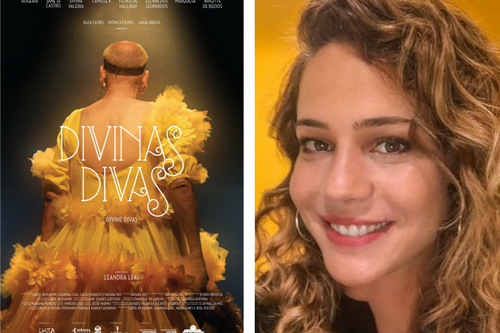 Brazilian actress and director Leandra Leal attended the screening and discussion of her recent documentary, "Divinas Divas." 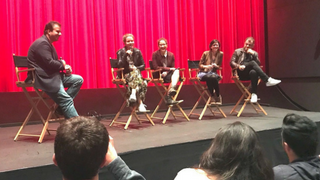 Last month, the Brazilian Film Series presented the Brazilian documentary: “Divinas Divas” at the UCLA James Bridges Theater. 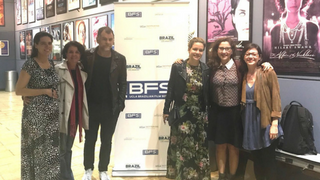 The screening was followed by a Q&A with director Leandra Leal, producers Carol Benjamin and Rita Toledo and music composer Plínio Profeta. Over 200 people attended the event and participated in the Q&A. Claudio Ramos hosting the Q&A with director Leandra Leal, producers Carol Benjamin and Rita Toledo and music composer Plínio Profeta. The Divine Divas are icons of the first generation of Brazilian transvestite artists of the 1960s. The film includes archival footage and performances, as well as recent interviews with several "divas" — Rogéria, Valéria, Jane Di Castro, Camille K, Fujika de Holliday, Eloína dos Leopardos, Marquesa and Brigitte de Búzio — as they get ready for a show that will celebrate their 50 years in the business. The performers talk openly about their memories and history. The Rival Theater, where most of the film takes place, was one of the first stages in Brazil to embrace trans and drag artists in the 1960s, a time when Brazil was ruled by a military dictatorship. The theater was owned by Américo Leal, grandfather of the film's director, Leandra Leal. Leandra, who also narrates the film, grew up there and has many found memories of the theater, the performances and the artists. She inherited the theater and currently runs it with her mother. Plínio Profeta; Leandra Leal; Carol Benjamin; and Rita Toledo. The Brazilian Film Series of the UCLA Center for Brazilian Studies (CBS) is currently in its 10th year. Recent films from Brazil are shown on the first Wednesday evening of every month at UCLA, usually followed by a discussion with the director. The series is cosponsored by CBS, the Brazilian Ministry of Foreign Affairs through the Consulate General of Brazil in Los Angeles and the UCLA Department of Spanish and Portuguese. The next screening in series will be December 6th at 7:30 p.m. at the UCLA James Bridges Theater. To stay up to date on the news and upcoming events of the Center for Brazilian Studies, consult the Center's website and Facebook page.